We’d love your help. Let us know what’s wrong with this preview of Gone Again by Doug Johnstone. To ask other readers questions about Gone Again, please sign up. I am not having a good run with books this year so far! This started off well, loved the relationship between father and son, but it deteriorated into implausibility and silliness. Starts well, particularly the relationship between the child & his father, but gradually descends into almost farce. This book confused me no end. The blurb on the back implies it's a thriller, but having seen Doug Johnstone in person recently, he himself described it as a study of the relationship between a father and his young son when the mother goes missing. If it's the latter, it's quite effective, but I didn't find the thriller bit all that convincing. The central characters, including Ruth the mother-in-law, are good, but I wasn't sure about the way the police conducted things around the book's main inci This book confused me no end. The blurb on the back implies it's a thriller, but having seen Doug Johnstone in person recently, he himself described it as a study of the relationship between a father and his young son when the mother goes missing. If it's the latter, it's quite effective, but I didn't find the thriller bit all that convincing. The central characters, including Ruth the mother-in-law, are good, but I wasn't sure about the way the police conducted things around the book's main incident. (I think they'd have been swarming around a possible crime scene.) I also felt completely unconvinced by the villains. For all that, I enjoyed this as a quick read (it's short, around 60,000 words), and also I enjoyed its setting around Portobello in Edinburgh, an area I know really well. I had to wait for someone in Portobello for 40 minutes and actually spent the time in my car reading about Portobello in Portobello. How cool is that? This book started off incredibly well--a sure recipe for a wonderful crime drama of sorts, but what seemed so promising fell flat 2/3 of the way in. The author lost his way, as did I. I give 3 stars for keeping me engaged enough to finish, but it was a chore when the story became too incredible. When it comes to high-octane psychological thrillers, Scottish writer Doug Johnstone knows how to deliver. I've read two of his novels — Smoke Heads (2011) and Hit & Run (2012) — and thoroughly enjoyed both. His latest novel, Gone Again, is another fine example of his raw, edgy and fast-paced narrative style. The story, which is set in Edinburgh, revolves around a newspaper photographer, Mark Douglas, whose wife, Lauren, goes missing. Lauren was supposed to pick up their six-year-old son, Nat When it comes to high-octane psychological thrillers, Scottish writer Doug Johnstone knows how to deliver. I've read two of his novels — Smoke Heads (2011) and Hit & Run (2012) — and thoroughly enjoyed both. 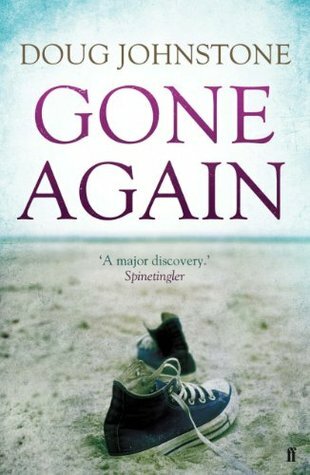 His latest novel, Gone Again, is another fine example of his raw, edgy and fast-paced narrative style. The story, which is set in Edinburgh, revolves around a newspaper photographer, Mark Douglas, whose wife, Lauren, goes missing. Lauren was supposed to pick up their six-year-old son, Nathan, from school, but she never turned up. Mark is out on assignment — photographing a pod of whales stranded in the waters off Portobello Beach — when Nathan's school principal calls him to break the news. At first, Mark thinks Lauren might have got side-tracked at work — she has a high-powered job in a real estate company — and simply forgot. But when she never answers her mobile or responds to her voicemail, Mark begins to suspect that something isn't quite right. Has she run away? Or has someone done her harm? This was fast paced and kept my interest although I often thought "Mark - what are you doing?!" At the end, some questions were left unanswered, and I liked this aspect but it might not be for everyone. There were a few twists in the plot and some of these seemed pretty unrealistic to me, which has lowered the final score I gave it. As a study of a man's relationship with his son, it was touching and I think that was my favourite part about it. the first half was great tension, waiting what could be the deal, but the last half wasn't as great. But satisfactory read, I did find myself wanting to know what happened. Great book! Becomes quite a page turner very early on when a mother disappears and her husband and 5 year old son are desperate to find her. I recommend!! I came across this author after reading another of his books, Hit & Run, which I really enjoyed and very much looked forward to reading more by him. Mark is very much your average type of guy. Married, a father to Nathan as well as a working man. On the day he gets the phone call to tell him that no one has picked Nathan up from school, he has no idea what a roller coaster of a ride his life is about to take. You can very much feel Mark's frustration that no one seems to be taking the disappea I came across this author after reading another of his books, Hit & Run, which I really enjoyed and very much looked forward to reading more by him. You can very much feel Mark's frustration that no one seems to be taking the disappearance of his wife, Lauren, seriously. He is sick with worry but is trying to go on as normal for the sake of his son, Nathan. Nathan is a very bright little boy though and he knows that something isn't quite right where his mother is concerned. Mark is trying his best to keep it together but as time goes on he starts to fall apart. Mark very much trusts his own instincts as to who is behind his wife's disappearance and more than once takes the law into his own hands and does some investigating of his own. This causes some dire consequences. This review has been hidden because it contains spoilers. To view it, click here. Somehow, one can guess on what/who was really behind the murder, but this was not a spoiler for me because of the no-fuss storytelling. I like it that the author was direct to the point, yet was able to hold my interest. Maybe it was because he was able to successfully put across the intensity of the protagonist's turbulent feelings. I was able to feel for him, even hating some of the decisions he made but rationalizing just the same; as if I was his own self. Only one thing I find quite impossib Somehow, one can guess on what/who was really behind the murder, but this was not a spoiler for me because of the no-fuss storytelling. I like it that the author was direct to the point, yet was able to hold my interest. Maybe it was because he was able to successfully put across the intensity of the protagonist's turbulent feelings. I was able to feel for him, even hating some of the decisions he made but rationalizing just the same; as if I was his own self. Only one thing I find quite impossible - how can a 6-year old boy fire a pistol/gun and hit his target? I don't know anything about guns, but I understand there's a lot of force involved in the firing action, that I find not plausible for a small boy to sustain. For the way the tension was built, this is worth three stars. The way the past was dripped into the novel created a tension which gave the story creditability. It is difficult to avoid spoiling this novel with a summary of the plot. Apparently no tension between husband and wife. Why had she disappeared before? Then real tension between husband and mother in law. To the degree that there is a restraining order, why? Is there something going on at work? Is the husband a suspect? The end provides some an For the way the tension was built, this is worth three stars. The way the past was dripped into the novel created a tension which gave the story creditability. A different offering from Doug Johnstone, and probably a touch below his normal high standards. His main character undergoes a bewildering set of trials including the murder of his wife, having his very young son involved in shooting an intruder, a rapprochement with his estranged mother-in-law, and dealing with a stolid police force. he triumphs in the end, in a sort of way, and Scotland provides its normal terrific background. As a whole, it is perhaps too much a stretch of the reader's credib A different offering from Doug Johnstone, and probably a touch below his normal high standards. His main character undergoes a bewildering set of trials including the murder of his wife, having his very young son involved in shooting an intruder, a rapprochement with his estranged mother-in-law, and dealing with a stolid police force. Doug Johnstone doing what he does best. He takes a reasonably simple event, complicates it, then builds on that complication until you have a full blown disaster. OK, sometimes he gets a bit carried away and if you isolate some of the events, they don't hold water (which is why it dropped one star in my review), but in the flow of the story they make perfect sense at the time. Good to see another Scottish story teller writing about Scottish locations. Not big historical places, but everyday towns Doug Johnstone doing what he does best. He takes a reasonably simple event, complicates it, then builds on that complication until you have a full blown disaster. OK, sometimes he gets a bit carried away and if you isolate some of the events, they don't hold water (which is why it dropped one star in my review), but in the flow of the story they make perfect sense at the time. This book started off well, yet dragged along quickly. I was tempted to stop reading halfway through but wanted to see how it finished. I didn't like the husbands violence and him hitting two women without remorse. He was very unlikeable. I also felt no connection with the characters especially the husband and wife. Left me not really interested in their relationship or what happened. The father son relationship was also cold. It was glad to be finished. I wanted this book to end. It started out interesting, but quickly deteriorated. The fact that the dad has no problem punching women in the face made me wish he would go to jail regardless of whether or not he killed his wife. His son was also crazily violent. What is up with that? The author wrote about it as if it was normal. This book is ok... I think I got the ending that I wanted less than half way through though, and then the rest of the book seemed to get more far fetched. I didn't really believe in the characters, although I did love the way that the relationship between father and son was handled. I'm not disappointed to have read this, but I won't be searching out any of his books in a hurry. This fast paced novel is based in Scotland, where a man has to deal with his wife's unexpected disappearance, and take care of his young son. She left once before while dealing with post-partem depression. Now with another baby on the way he is trying to keep his young son in the dark about where his mom went. Too much happened, Mark would have been in jail. He was a very violent man, smacking women around when he got angry. Didn't believe Ruth would have come around like she did, probably would have just tried to get custody of Nathan. I loved it, read it in one day! This was exciting all the way through, but the ending was a little lackluster. This was a struggle to get through. I'm not a DNF-er, because I need to know what happens, becauase regardless, I feel somewhat invested. This was another fallen casualty to the "GONE" in the book title war. The premise of the story is that Mark (husband and father) gets a call from school, asking him to pick us his son, Nathan. He responds by saying that his wife was supposed to pick him up, like she does every other day, and it's all an uphill battle from here. Turns out, this isn't the first t This was a struggle to get through. I'm not a DNF-er, because I need to know what happens, becauase regardless, I feel somewhat invested. This was another fallen casualty to the "GONE" in the book title war. The premise of the story is that Mark (husband and father) gets a call from school, asking him to pick us his son, Nathan. He responds by saying that his wife was supposed to pick him up, like she does every other day, and it's all an uphill battle from here. Turns out, this isn't the first time his wife has taken off, and that Nathan has been picking up on all of this. This is essentially a basic potboiler -- a generic mystery with some domestic drama thrown in. On the quality and strength of writing, this might've been a 3/5 or so, however the two biggest issues with the book are its total lack of coherent plot, and its weird undercurrent of misogyny. The plot and resolution come from nowhere, feel terribly convenient, and all kinds of other plot threads never quite get resolved or brought up again in a meaningful way. And why, exactly, is the main character so This is essentially a basic potboiler -- a generic mystery with some domestic drama thrown in. On the quality and strength of writing, this might've been a 3/5 or so, however the two biggest issues with the book are its total lack of coherent plot, and its weird undercurrent of misogyny. And why, exactly, is the main character so annoyed with women in general? At some point you expected it to be an actual function of the story, but instead our male hero goes around sneering at basically every woman he encounters. Women with jobs are useless and stupid. Women without jobs are money-hungry leaches. what can we do with Doug Johnstone? have a really really rubbish stupid ending to the book almost like its written by an 8 year old, generally omg so and so is the baddy, he's trapped the goodies, they have a fight, a gun goes off and they escape. every book the same, and yet I keep reading them because I generally like the what can we do with Doug Johnstone? every book the same, and yet I keep reading them because I generally like the way the books are written and do feel im in the story until the last 10% when im thrown out of the zone and reminded im reading a badly written ending. Immediately, the reader is drawn into the book -- a missing wife, a frightened turned frantic husband, a sweet innocent little boy. The story is fast paced yet the author has spent time developing the characters. The grief, numbness, and anger are described vividly. The last third of the book is more unbelievable, crisis mounting on crisis, but then an action, mystery, thriller should be that way. I am not a fan of foul language used repeatedly. This novel had more than I would have preferred bu Immediately, the reader is drawn into the book -- a missing wife, a frightened turned frantic husband, a sweet innocent little boy. The story is fast paced yet the author has spent time developing the characters. The grief, numbness, and anger are described vividly. The last third of the book is more unbelievable, crisis mounting on crisis, but then an action, mystery, thriller should be that way. I am not a fan of foul language used repeatedly. This novel had more than I would have preferred but it was, for the most part, simply the reaction and conversation that would take place in this scenario. Gone Again is written by Doug Johnstone. A story about a young boy, Nathan, and his father, Mark, and Mother, Lauren. When Lauren has gone missing Mark and Nathans lives change forever. The mystery of what happened to Lauren and what Mark does to figure out the death. One critique I would have is that there are parts of the story that are elongated that make the story a bit boring at times. The author tends to have a major detail or event that he focuses on for a big portion of the book and then Gone Again is written by Doug Johnstone. A story about a young boy, Nathan, and his father, Mark, and Mother, Lauren. When Lauren has gone missing Mark and Nathans lives change forever. The mystery of what happened to Lauren and what Mark does to figure out the death. One critique I would have is that there are parts of the story that are elongated that make the story a bit boring at times. The author tends to have a major detail or event that he focuses on for a big portion of the book and then moves on to the next. As the plot moves along the readers finds out more about the relationship and family history which helps develop the answer to, why Lauren was murdered. The second half of the book started to become impractical and hard to believe. Making the book hard to follow and finish.